There are 600 million social media users in China, providing marketers with almost an unmatched opportunity to understand the Chinese consumer. 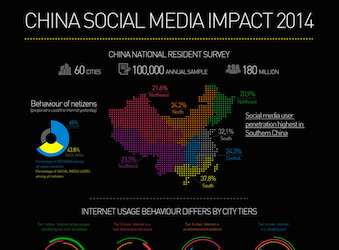 Kantar’s ‘China Social Media Impact Report 2014′, released this week, shows that on a 100-point scale to rate social media’s impact, Chinese users’ average rating is 73.4 points, indicating a strong positive view. Global researcher Kantar carried out the report through data mining, Weibo text mining and online polling. The research covers 60 Chinese cities, an adult sample of 74,000 and three million Sina Weibo posts. Check out the rest of the results below and read more about the study here.